Goats help families earn an income and are an excellent source of protein. PWS&D completed a long-term project in Pakistan (2012), working with Canadian Foodgrains Bank (CFGB) and Church World Service-Pakistan/Afghanistan (CWS-P/A). The project worked to improve people’s access to food, empower women through self-help groups, develop small businesses and provide loans and literacy training. With generous support from Presbyterians, subsistence farmers learned about sustainable farming, gardening, land conservation and irrigation. Farmers were able to diversify their crops through access to seeds, and water storage ponds were built to irrigate farms and increase yields for improved nutrition. Women helped through the project are saving and lending money on a regular basis, increasing their incomes and confidence. Through this comprehensive program addressing the root causes of vulnerability and poverty, lives have been changed in Pakistan. Unfortunately, between 2010 and 2014, Pakistan has experienced catastrophic flooding that destroyed crops and homes. 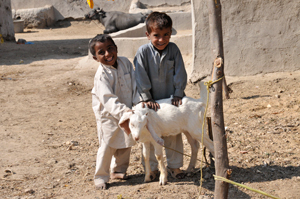 PWS&D is actively working with partners in Pakistan to help families recover and reclaim their livelihoods. Other ongoing work in Pakistan includes providing emergency assistance to 4,000 internally displaced families in North Waziristan who are escaping fighting.